Workshop Restorative Circles and Installing a Restorative System by Charlotte Keijzer. Working as a judge Charlotte participated for years in a justice system that strongly fixes participants to their positions like victim, defendant or plaintiff, fostering them to stick to their one and only perspective of the case. In this system a change of perspectives could easily be qualified as a sign of weakness, considerably diminishing the parties’ chances to convince the decision makers of their being right. Charlotte experienced how this system limits people in finding a satisfactory answer to their adversarial situation. Nevertheless we all take systems like this for granted, up to the moment that we very consciously create a new system. In this workshop we offer the opportunity to experience how to deal with conflict in a completely different, dialogical way. 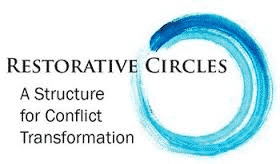 We start by shortly outlining the main principles of a Restorative Circle according to Dominic Barter. This approach offers a technique to help participants to again listen to each other and, more important, to make sure that they feel heard by important others. Once at this point they will feel new space to propose and develop solutions for the problems at hand. The process is designed to support, and not to suppress, conflict. Subsequently there will be a clinic where participants are invited to bring a real conflict to be dealt with in a semi simulated circle. One or two of those conflicts will be used to go through the restorative process of specific questions and dialogical dynamic. Participants will have the opportunity to act as facilitator. In the afternoon we will investigate whether the Perspectivity Community could be a place to create a Restorative System. A Restorative System welcomes, engages with and listens to conflict – for the well-being and growth of the community. We will go through the key stages and guiding questions to explore whether a Restorative System that uses Restorative Practices could support the Perspectivity Community in having and learning from conflict.